"My Neighbor Totoro", "Howl's Moving Castle", "Spirited Away", "Kiki's Delivery Service"...Have you ever heard of them? They are movies that give you wonder and fulfillment made by the famous film creator Hayao Miyazaki. For years, he has created fantastic animated movies that entertain both children and adults; and his creativity is highly respected worldwide. In Mitaka (Tokyo), there is an art museum called the "Ghibli Museum Mitaka". It is a fabulous place where you can visit the worlds created by Japan's Ghibli Studios. In the museum there are numerous exhibition rooms, galleries, a library, play areas for children, and gift shops selling items such as hand printed animation cells and wood engravings. One recommended spot in this museum is the "Nekobasu (Cat Bus)" on the second floor. This room has a gigantic stuffed doll of Nekobasu (A popular character from the movie "My Neighbor Totoro") for children to play in. 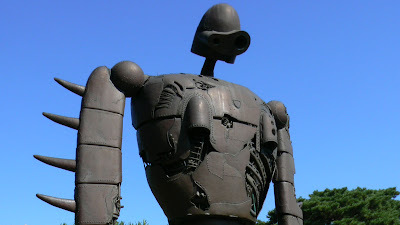 Also, on the highest floor, there is a five-meter high robot army from the movie "Laputa: Castle in the Sky". This place is surely an irresistible dream-like world for Ghibli fans worldwide. In every room you enter, a new world spreads before you and will not allow you to stop smiling. To enter the Ghibli museum, tickets (with an appointed time and date of entrance) must be purchased in advance. Tickets can be purchased at a nearby Lawson (Convenience Store). Admission is 1000 JPY for adults and university students, 700 JPY for high school and middle school students, 400 JPY for elementary school children, and 100 JPY for children over 4 years of age. 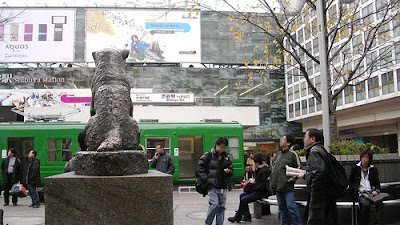 Ever wonder why there is a statue of a dog right outside of Shibuya station? This dog is named Hachiko. Taken care of by a professor named Eizaburo Ueno from 1924, he was a lovable and gentle Akita dog. Hachiko would see Ueno off every day as he left for work and wait for him at Shibuya station when he returned. This relationship was observed by many people in Shibuya. Even after Ueno died in 1925, Hachiko waited all day and night in Shibuya for his master. This movie-like scene struck everyone, making the dog famous for his loyalty and devotion; and he was given the name Chuken Hachiko (Faithful dog Hachiko). In 1934, a statue honoring him was placed at Shibuya Station. Later in 1935, Hachiko was finally reunited with Ueno at age 13. The statue in Shibuya today is the second statue of Hachiko because the original statue was used in WWII to support the war effort. Today, this statue is the most notable and frequented meeting spot in Shibuya. The exit closest to the statue is even called the "Hachiko Exit". Next time you meet a friend in Shibuya, why not use the "Faithful dog Hachiko" as a meeting spot?? This wonderful story about Hachiko has now been made into film (Titled "Hachiko: A Dog's Story") starring Richard Gere as the professor, and will be in theaters this summer in Japan. It is a remake of a Japanese movie released in 1987. Bonenkai was about three months ago - so it's almost time to go crazy and wild and drink again with friends in Japan. The season of cherry blossoms is coming up and that might be the best excuse to celebrate! The word "Hanami" literally means "to watch / view flowers" but it also means to drink and have a party underneath the sakura (cherry blossoms) trees and not any other flower. Some people like to just take a walk or take pictures of the cherry blossoms too, but most people like to party instead. Most popular place to party in tokyo is known to be Ueno Park. The whole park will be filled with cherry blossoms and loud partiers. They will have food stands in the park as well. So if you and your friends are planning to go crazy, then wild Ueno is the place to be! Also since you are at Shinobazu Lake, you can enjoy the sakura from boats too. Another place where you can enjoy hanami is Inokashira Park in Musashino City. Many University students have their hanami party here since there are many Universities near this area. The park has a pond in the center and you can enjoy viewing the sakura trees surrounding the pond from pedal boats as well - just as it is in Ueno. A different way of enjoying sakura is by taking a walk and watching these beautiful flowers. Some major places where people frequent are by the Meguro River and by the Sumida River. Get off the train at Meguro or Naka Meguro station and take a walk down by the riverside. There are a remarkable numbers of cherry blossoms. The best time period to see the blossoms is around noon as the sunlight highlights the color of the flowers. Another good time are the weekends during the hanami period; but because it gets very crowded, it might be best to just take a walk spontaneously instead of going on the weekends when there are many people. Get off at the JR or subway line at Asakusa or Asakusabashi station and take a walk down by the Sumida River. The river boat starting from Hamamatsucho is also very popular during this season. There are some spots where many homeless people live by the Sumida River, but in general, these homeless people won't be bothering you. 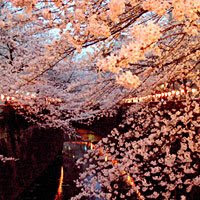 The cherry blossoms by the river are very beautiful, so it is worth going there. 'Tis the season of sakura and hanami, so gather your friends and family and have a nice day outside in the park. Eat, talk, and have some drinks outside with your loved ones! When spring is just around the corner, many Japanese people enjoy eating Sakuramochi -a traditional "wagashi" (Japanese confectionary). When visiting Japan in the spring, you may see Sakuramochi in many places. This time, I will offer you with some basic information about Sakuramochi. 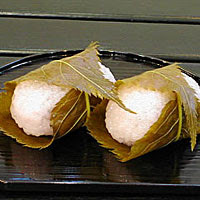 A typical Sakuramochi is anko (bean paste) wrapped in dough that is wrapped once again with a brined cherry blossom leaf (as seen on the picture). This confectionary has been eaten since the 1700s and there are two types of them. One is called Chomeiji (Kanto Style) and the other is called Domyoji (Kansai Style). The differences between the two are the ingredients used to make the mochi's pink dough and its shape. Chomeiji Sakuramochi are made using regular flour and usually shaped like waffles. On the other hand, Domyoji Sakuramochi are made using a special powder called Domyoji powder and shaped like a straw rice bag. Domyoji powder is steamed mochi-gome (sticky rice) that is later dried and ground. It is different from other mochi because of its lumpier texture. In eastern Japan (Kanto Area), Chomeiji Sakuramochi is more familiar to people and is also sold in convenience stores. In western Japan (Kansai Area), people are not familiar with the Chomeiji Sakuramochi and prefer the Domyoji Sakuramochi instead. Surprisingly, most people do not even know that there are two different types of Sakuramochi. Recently, however, it is not difficult to find a Domyoji-style Sakuramochi in the Kanto area. Another interesting fact about Sakuramochi that is common in all areas of Japan is the use of brined cherry blossom leaf. Although it is not popular, those who like it say that the saltiness of the cherry blossom leaf complements the sweetness of the anko that is inside. This varies between people, so go ahead and taste one yourself! Why not enjoy a nice hanami (cherry blossom watching) with a delicious sakuramochi as a snack?? Bullet trains, referred to as Shinkansen in Japan, is a high-speed train operated by the Japan Railway Group. 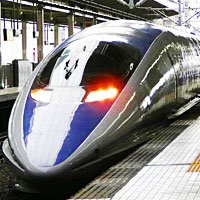 The original Shinkansen is known for its round bullet like face and white body with a blue stripe in the body. The Tokaido Shinkansen, the most used bullet train in Japan, was first opened in October, of 1964 just in time for the Tokyo Olympics. Before the existence of the Shinkansen, it took 6 hours and 40 minutes to travel from Osaka to Tokyo but Shinkansen has shortened the time to 4 hours. It might sound like, "So what? The time was only shortened two hours", but at that time that meant a lot. From Tokyo to Shin-Osaka, it is operated by JR Central, costs around 14,000 yen one way and takes about 156 minutes (2hours and 36 minutes) to get from Tokyo to Shin-Osaka. From Shin-Osaka to Hakata, operated by JR West, costs around 14,890 yen, and takes about 148 minutes (2 hours and 28 minutes) to get from Shin-Osaka to Hakata. From Tokyo to Hachinohe, operated by JR East, costs around 15,350 yen and takes about 189 minutes (3 hours and 9 minutes) from Tokyo to Hachinohe. From Omiya to Niigata, operated by JR East, costs around 9,860 yen and takes about 99 minutes (1hour and 39 minutes) from Omiya to Niigata. From Takasaki to Nagano, it is operated by JR East, costs around 4,920 yen one way. The train takes about 47 minutes to Nagano from Takasaki. Taking an airplane has become the most simple and usual way of transportation, but riding a Shinkansen and enjoying the scenery outside your window is another way to go too. Save the world by riding the green way, Shinkansen, and enjoy the seasonal scenery of Japan! Japan gives convenience stores real meaning. On any given street it is possible to find as many as seven or eight "Konbini" - the Japanese version of a convenience store. You can always depend upon having one very close by. Just standing on the street where I live, I can see three! Compared to the convenience stores that I am used to, these are very different. They have the same function of providing quick, cheap food and supplies; but with quite different things being offered. I know of at least four different "Konbini" companies that can supply anyone with a quick can of coffee or a cheap "Onigiri" (riceballs) in Tokyo. Japan has taken the best of the convenience store idea and adapted it to Japanese expectations. There are things like Calpis (a sweet milky white drink that you have to try to understand! ), Japanese bread (which is often stuffed with strawberry paste, chocolate, or custard; and is always sold in a single serving), and fresh sushi all in the same place! The store workers are almost always polite and welcoming, even when you go to buy ice cream at one in the morning. I have even been fortunate enough to find convenience stores on the first floor of office buildings or tucked away in a quiet residential neighborhood-where it would seem rare to find such a thing. They are everywhere! Compared to the many convenience stores I have visited in the most modern countries in the world Japan's are much more reliable and interesting. It is also interesting to notice that because so many people don't own cars in Japan, there are many convenience stores that don't necessarily have gas pumps attached to them. This allows for many more convenience stores to be designed with more of a focus on food. With the dense population of Tokyo there are many more people walking than driving and the ratio of motor vehicles to gas stations is represented as is the ratio of convenience stores to people walking around in the street. The best thing about this is that there is more room for the delicious. Roppongi is an area in central Tokyo that is busy from day to night. Why?? That's because everything you want to keep yourself busy is there! First of all, there is the famous Roppongi Hills. The beautiful 54 story building -mostly used as an office for world famous companies- stands tall in the center of the district. Making its debut in 2003, the Mori Tower also has an arena where small concerts are held and an observation deck on the highest floor. On a beautiful day, you can see Mt.Fuji from there! Near the building are a movie theater, the Roppongi Hills Residence (a residential building), a museum, and brand name stores. During the day, this area is very busy and filled with business men and women in suits. However, at night it changes into a completely different place. Thousands of night clubs are there in Roppongi making it a lively nightspot for partiers of all ages. 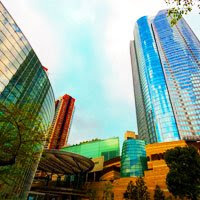 Because Roppongi is the home to numerous embassies and many companies with international affiliations, this area is also very famous for having many international people. Many musicians from overseas frequently visit Roppongi as well! As a result, most stores are comfortable helping international customers. If you become tired of being surrounded by so many Japanese, I recommend going to Roppongi! Go blow your stress away! Narita city is a city sizing about 214 square kilometers, with approximately 120,000 people living. 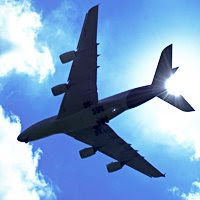 As people who have stayed at Narita might know already, Narita city is not the most popular tourist sight even though it is located right next to the International Airport. But today I would like to introduce you to things that you were missing out. Narita has a terrific location for people who love to take airplane photographs. A small park called 'Sakura no yama hill' is a great place where you can shoot best shots of airplanes just landing or taking off to the air. Furthermore, there are Sakura (cherry blossom) trees planted around in the park, so if you come during the blooming season, you could take a picture of an airplane with beautiful pink cherry blossoms surrounding it. Another activity you could enjoy at Narita is to stroll around the temple town. The main street, Omotesando, runs down from JR Narita station to the Naritasan temple. The whole passage to Naritasan is filled with stores that have history of more than 100 years. In summertime, a festival is held on this main street. Beside these stores many candy stands fill the street too. When you finish the walk through the Omotesando, a huge gate with 'Naritasan' written across it welcomes you. Naritasan is the main temple for the Shingon sect of Buddhism. It was first founded by a monk, Kancho-daisojo, in the year 940. Since then, it has been loved and worshipped by many from around the world. During the 'jyuken' season in January, students go to the main hall of Naritasan to get stamps on their foreheads for academic success.